Western toads found on the Central Coast. Photos by, clockwise from bottom left: Ian Thomas, Nancy Shackelford, Sara Wickham Sarein Basi-Primeau, Jennifer Walker, and Chanda Brietzke. The western toad is easily recognized by its dry, bumpy skin, the light stripe down its back, and its horizontal pupils. This stripe is usually white or cream-coloured, and the rest of the body can vary from nearly black or reddish-brown to olive-green or even pale green. The body can have mottled, patchy, or somewhat spotted colouring. The toad's belly is pale and usually mottled with black. There is a large oblong-shaped swollen gland behind each eye, called the parotid gland. 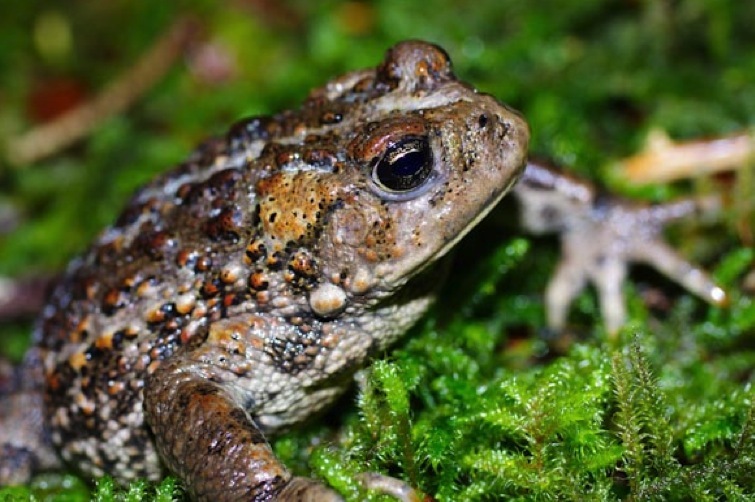 The western toad has a stocky body and short legs. Adults are 5.5-14.5 cm long, and females are generally larger than males. Western toad eggs are white on one side and black on another, and look like strings of small black pearls when in water. Tadpoles are black or charcoal grey, and about 1 cm long. 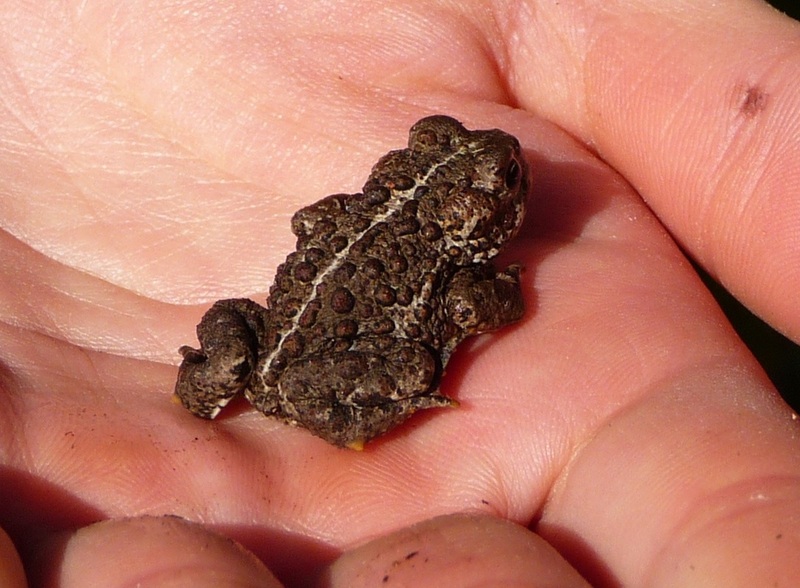 After metamorphosis, the baby toads (toadlets) look like miniature adults but without the pale back stripe. ​Click here for a detailed species fact sheet. The western toad breeds in a variety of temporary and permanent aquatic habitats, ranging from ditches to lakes. Canopy cover, coarse woody debris, and surrounding vegetation don't seem to be important factors in a breeding site, but sandy-bottomed sites are preferred. The toad's terrestrial summer habitats vary from grasslands avalanche slopes to forests; damp areas are preferred. In the winter this species hibernates underground, below the frost line, in burrows dug by itself (which canb e up to 1.3 m deep) or ones formed by small mammals. 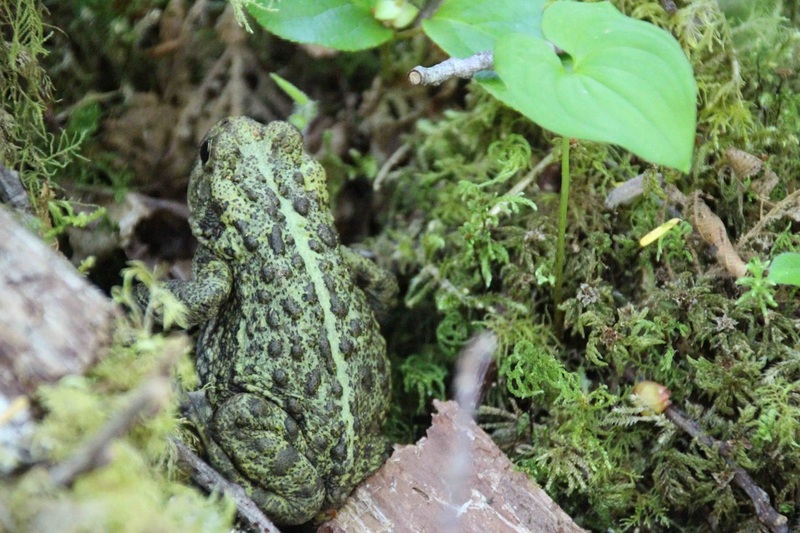 The western toad is found throughout most of BC, and is the only amphibian native to Haida Gwaii. Its range extends north to Alaska and the southern Yukon, and south to Baja California. It is found in many western states in the US, and is also found in western Alberta. It lives at elevations from sea level to about 3600 m.
Only a few other frog or toad species are found on the Central Coast, and none of these species have the bumpy skin and back stripe of the western toad. Other species found in the region are the northern red-legged frog, the Pacific chorus frog (Pacific tree frog), and the tailed frog. 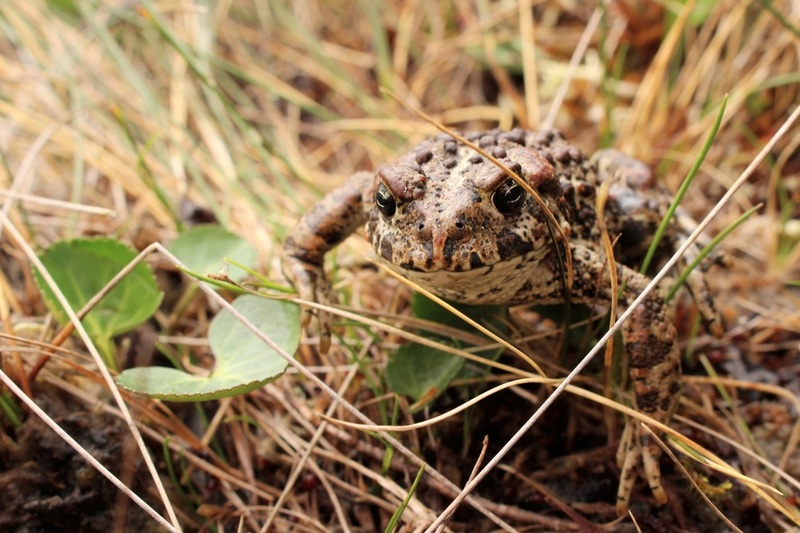 Male western toads make a quiet 'release call' when their bodies are grasped. This call is used during mating season when they are accidentally grasped by other males searching for a mate (males grasp females during mating), but they tend to call when picked up by humans as well. Western toads are mostly nocturnal. They hibernate for 3 to 6 months per year. A female western toad lays 12,000-16,500 at once, but less than 1% of these eggs will survive to adulthood. The western toad is blue-listed in BC, and is listed by COSEWIC as a species of special concern. It is protected by Canada's Species At Risk Act, but there is currently no recovery strategy for this species (as of July 2013). 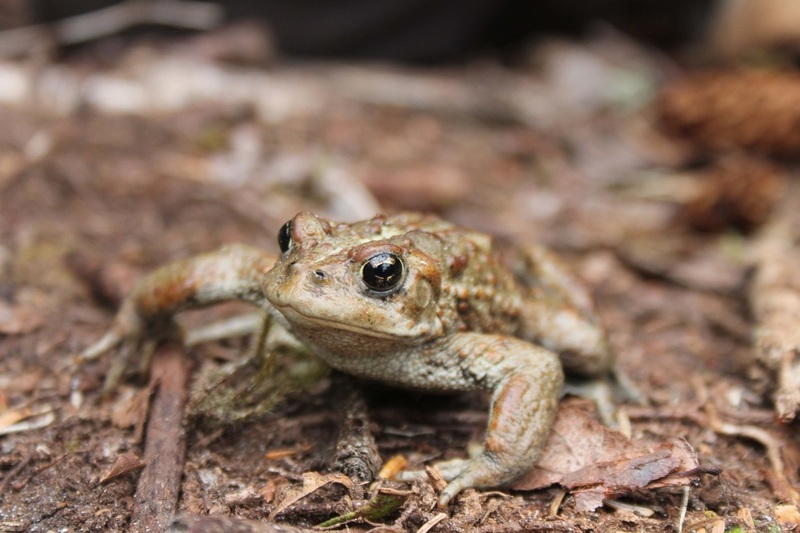 Threats to western toads include the amphibian chytrid fungus, to which they are particularly sensitive, as well as habitat destruction and fragmentation by urban and agricultural development. Stocking fish into lakes where those species are not naturally found may also impact western toad populations, as these fish often carry diseases that can impact tadpoles and toads. Stocked fish and other introduced species such as bullfrogs also compete with western toads for resources. Read more about these threats in the 2002 COSEWIC Assessment and Status Report. 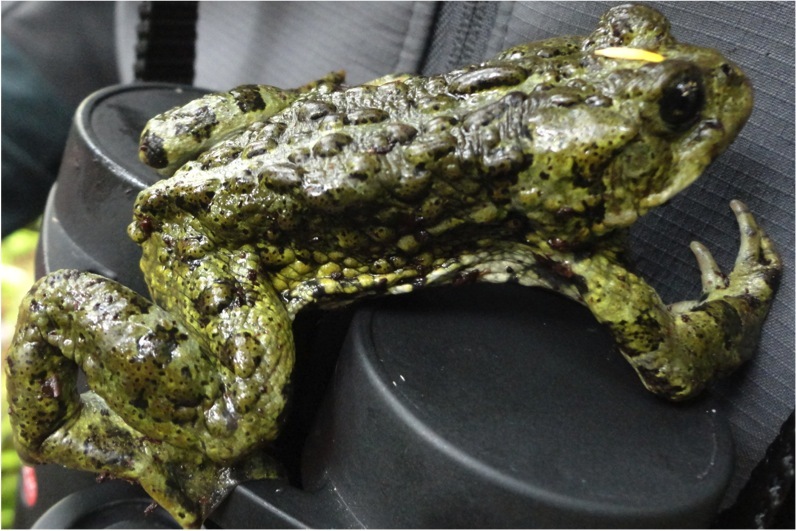 Watch the following videos to learn about the migration of western toads and why they need protecting (left), and to learn about the chytrid fungus epidemic (right). (2012). Western Toad Species Profile. Species At Risk Public Registry. Government of Canada. Accessed 13/08/2013. Anaxyrus boreas Baird & Girard, 1852. In Klinkenberg, Brian. (Editor) 2012. E-Fauna BC: Electronic Atlas of the Fauna of British Columbia. Lab for Advanced Spatial Analysis, Department of Geography, University of British Columbia, Vancouver. Accessed 13/08/2013. Edwards, W. Western Toad. BC FrogWatch Program. Ministry of Environment, Province of British Columbia. Accessed 13/08/2013.